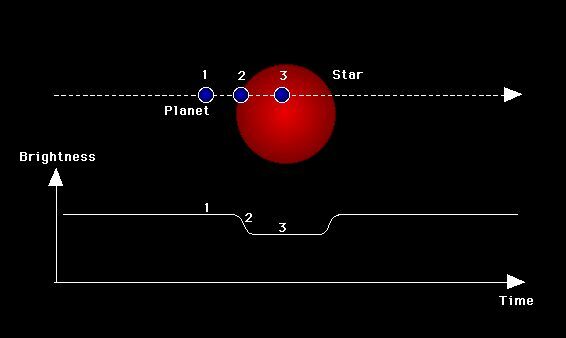 transit method of detecting planets. stars in the CM Draconis system. The relatively large proper motion of the CM Draconis system was discovered in the early 1960s by Willem Jacob Luyten (1899-1994), who found the proper motions of over 520,000 stars despite the loss of sight in one eye since 1925 by building an automated photographic plate scanner and measuring machine. In 1967, the reddish component was found to be an eclipsing binary by Olin Jeuck Eggen and Allan Sandage. 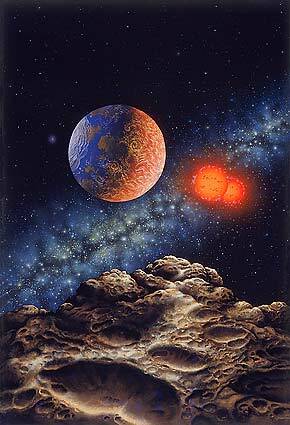 In 1996, two teams of astronomers announced the possible detection of a planetary transit eclipse of the close binary pair CM Draconis Aab, which has yet to be confirmed (further details below). 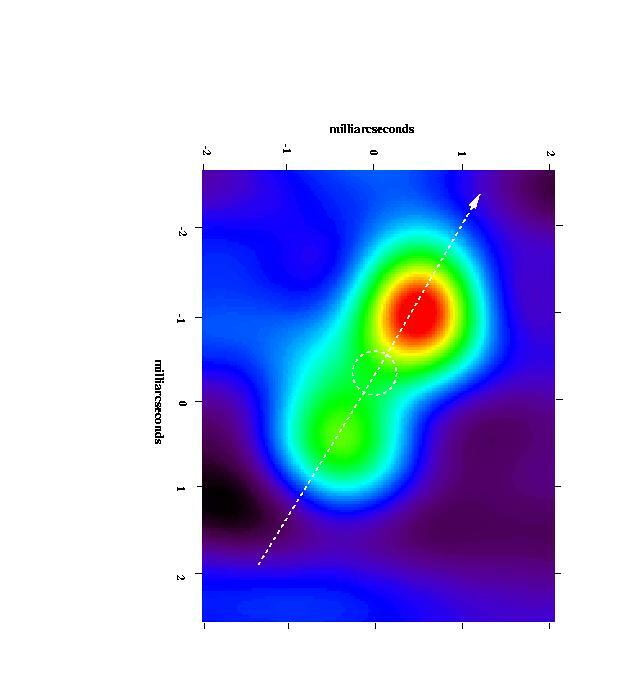 This cool and dim, main sequence red dwarf (M4.5 Ve) and its companion Ab have a total disc area of about 12 percent that of Sol's and a combined luminosity of 1.03 percent of Sol's (Doyle et al, 2000). Star Aa may have about 24 percent of Sol's mass and 25 percent of its diameter (see a TEP page on CM Draconis). 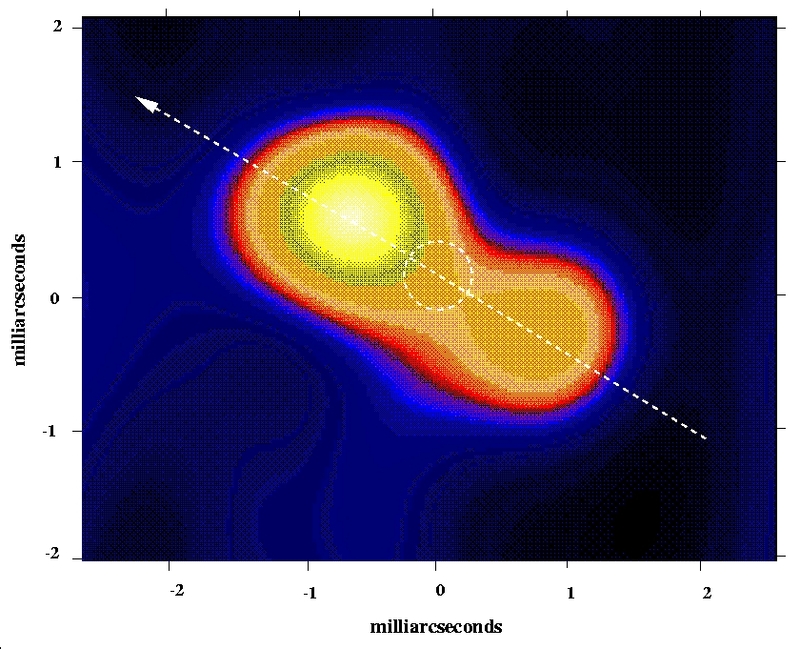 Its large space velocity of 164 km (102 miles) per second and low flare rate are consistent with its probable status as a relatively old, Population II star (McCook et al, 1997; and Metcalfe et al, 1996). The spectrum of stars Aab is similar to that of Barnard's Star (S. M. Rucinski, 1978). The Aab system has a low flare rate of 0.025 per hour (Deeg et al, 1998). Both flare stars Aab are defined as BY Dra type variables, with CM Draconis as their variable star designation. Some useful star catalogue numbers are: CM Dra A, GJ 630.1 A, G 226-16, G 225-67, LHS 421, and LP 101-15.
younger UV Ceti (Luyten 726-8 B) shown flaring at left. This main sequence red dwarf star (M4.5 V) may have only 21 percent of Sol's mass and 6.2 percent of its diameter (see TEP page on CM Draconis). 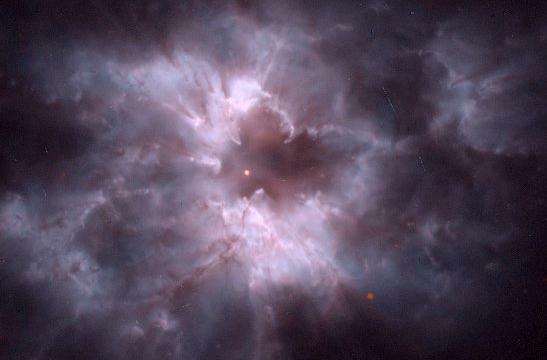 with elements heavier than hydrogen when it cast off its outer gas layers) like planetary nebula NGC 2440. This even dimmer, main sequence white dwarf star (DQ8 /VII) may have only 18/100,000th of Sol's luminosity. The stellar remnant has cooled, become dimmer over time, and is presumed to be relatively old (perhaps around nine billion years like its binary companions). In theory, it has around 0.6 to 1.4 times Sol's mass with only a planet-sized diameter (e.g., around one percent of the Sun's). Useful catalogue numbers include: CM Dra B, GJ 630.1 B, G 226-15, G 225-68, EG 258, LHS 422, and LP 101-16. View from an asteroid of tightly orbiting red dwarfs with a tidally-locked planet in the system's liquid water zone. The hypothetical planet's darkside ice cap is backlit from a nearby white dwarf in the distance. In 1996, two teams of astronomers announced the possible detection of a planetary transit eclipse of the close binary pair CM Draconis Aab (Guinan et al, 1998; Martin and Deeg, 1996; and Guinan et al, 1996). The initial discovery of a brown-dwarf-sized object was disputed (Deeg et al, 1998). Eventually, it was determined that no substellar objects around CM Draconis larger than about three Jupiter-masses are orbiting closer than one AU (Doyle et al, 2000). As of mid 2000, further observations and analysis suggested that one (or two) planet(s) of at least 2.5 Earth diameters across in a 21- or a 26-day orbit and a farther out giant planet in the range of 1.5 to three Jupiter masses at an orbital distance of 1.1 to 1.45 AU around the close-orbiting binary's barycenter (Deeg et al, 2000). For low-mass eclipsing binary stars, the method of eclipse minimum timing allows astronomers to search for smaller masses than those feasible with radial velocity measurements. Some astronomers, however, have recently detected starspots which can result in false non-periodic detections and also a long-term variation in "seasonal" averages with a period of several years which deserves further study (Hargis et al, 2000). In any case, a circumbinary orbital distance from CM Draconis Aab where an Earth-type planet would be comfortable with liquid water would be centered around 0.3 AU, with a "year" of 18 to 35 days. (Doyle et al, 2000; in Scientific American). See an animation of the orbits of the two stars and their potentially habitable zone, with a table of basic orbital and physical characteristics. Many dim, red (M) dwarf stars exhibit unusually violent flare activity for their size and brightness. These flare stars are actually common because red dwarfs make up more than half of all stars in our galaxy. Although flares do occur on our Sun every so often, the amount of energy released in a solar flare is small compared to the total amount of energy that Sol produces. However, a flare the size of a solar flare occurring on a red dwarf star (CM Draconis) that is more than ten thousand times dimmer than our Sun would emit about as much or more light as the red dwarf does normally. Flare stars erupt sporadically, with successive flares spaced anywhere from an hour to a few days apart. A flare only takes a few minutes to reach peak brightness, and more than one flare can occur at a time. Moreover, in addition to bursts of light and radio waves, flares on dim red dwarfs may emit up to 10,000 times as many X-rays as a comparably-sized solar flare on our own Sun, and so flares would be lethal to Earth-type life on planets near the flare star. Hence, Earth-type life around flare stars may be unlikely because their planets must be located very close to dim red dwarfs to be warmed sufficiently by star light to have liquid water (just over 0.1 AU for CM Draconis Aab), which makes flares even more dangerous around such stars. In any case, the light emitted by red dwarfs may be too red in color for Earth-type plant life to perform photosynthesis efficiently. The late John Whatmough created illustrated web pages on this system at Extrasolar Visions. Up-to-date technical summaries on this star can be found at: the TEP Network page on CM Draconis; Jean Schneider's Extra-Solar Planets Encyclopaedia; the Astronomiches Rechen-Institut at Heidelberg's ARICNS for Star A and Star B; and the Nearby Stars Database. Additional information may be available at Roger Wilcox's Internet Stellar Database. Constellation Draco is associated with the dragon slain by Cadmus, the brother of Europa. It is a large and elongated constellation of the northern hemisphere and is one of the few constellations which really resemble the object they were named after. For more information about the stars and objects in this constellation and an illustration, go to Christine Kronberg's Draco. For another illustration, see David Haworth's Draco.